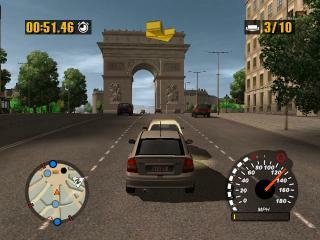 Midtown Madness 3 review Game Over Online - http://www.game-over.com Ever dreamt of cruising through Paris in an Audi TT, jumping over La Seine, driving under the Eiffel Tower, and racing past the Louvre? Perhaps you’ve fantasized of touring around Washington D.C. in a cement truck, crashing into the U.S. Capitol, smashing through Chinatown, and scaring the suits outside the White House? If such thoughts have crossed your mind, Midtown Madness 3 just might be your ticket, as long as you’re ready to risk that new paint job. Midtown Madness 3 marks the arcade driving series’ first appearance on the Xbox. Swedish developer Digital Illusions has created two massive and thriving metropolises, namely Washington D.C. and Paris. Each city is dressed with residential areas, business districts, busy downtown streets, a freeway (Paris only), famous monuments and parks. The communities are vibrant with traffic and pedestrians, and the usual objects you’d see on the streets are present, including outdoor seating areas at corner cafes, traffic signs, park benches, fire hydrants, and fences, just to name a few. In a nice little touch, some pedestrians carry around an Xbox in a larger-than-life box, poking a little fun at the often-exaggerated size of Microsoft’s console. I’ve heard the odd complaint that two cities isn’t enough, but the cozy one-ways of Paris and the bustling streets of Washington D.C. provide unique and sizable environments to wreak havoc in. Each city offers a single-player campaign where you’ll get to work as an undercover agent. Here, you’ll assume the role of several different jobs, such as a delivery guy, a chauffeur, a paramedic, a police officer and a car salesman. 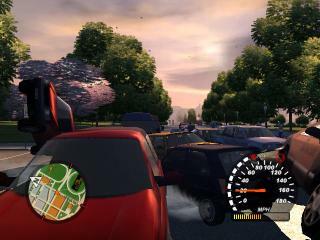 Each job is further separated into a handful of missions in which you’ll need to complete tasks that involve driving through checkpoints, racing against arch rivals, and even ramming someone else’s vehicle until it breaks down. Time constraints often make the tasks more difficult, so you’ll need to learn a few shortcuts. As you complete each task, you’ll unlock new undercover missions, as well as new cars. 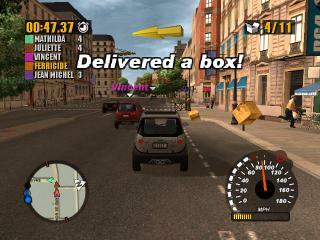 If working undercover isn’t your bag, you can race against time in the Blitz mode, or race against other drivers in the Checkpoint mode. Each city offers 10 courses in each of these modes. Successfully completing sets of three will unlock new courses and cars. 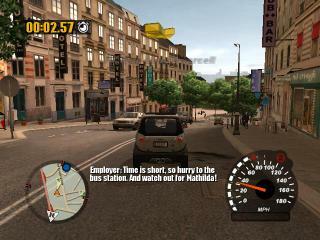 Last but not least, the Cruise mode allows you to do just what it says, take any car for a cruise around the city. In total, there are 30 cars to unlock. The diverse line-up includes such bruisers as a bus, an armoured car and a Hummer; such classics as a 1959 Eldorado Seville and a 1967 Mustang 2+2 Fastback; and such speed demons as the Lotus Esprit V8, the Audi TT and the crème de la crème, the Koenigsegg CC. Before you start cruising, you can toggle a number of options, including traffic and pedestrian density, the time of year (summer, fall, etc. ), time of day, and weather conditions. 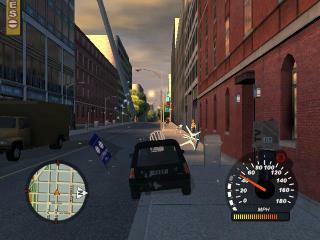 You can also toggle the cop density, depending whether you enjoy the thrill of the chase. “I’m trying to impress the director of ‘The Quick and the Slippery’, Michael Tortellini. There’s something about him and his brother, Stefano Tortellini, that doesn’t quite sit right. There’s also a hot-shot producer in town. He sounds like a shady character too. Anyway, I’m currently competing against this chick Angelina who always seems to take the same undercover jobs that I do”. “Who with the what now”? “I’m trying to unlock the 1967 Mustang 2+2 Fastback”. “Cool, that’s a classic car”. “Yeah, then I get to work as a police officer”. “Wait a minute, wouldn’t that blow your cover”? “You’d think so, but I’ll get a chance to unlock the Dodge Viper SRT-10”. That’s the only issue with the single-player campaign. Whether you’re working undercover or racing in either the checkpoint or blitz modes, unlocking the next car is all you really think about. And once that’s done, well, there’s little incentive to go back and play it again, other than to beat your previous time. 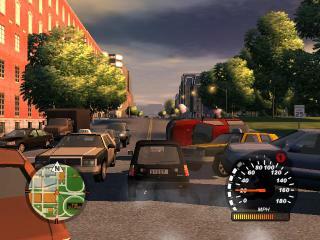 This leaves the cruise mode as the only single-player mode worth revisiting, and even it can become repetitive once you’ve seen all the two cities have to offer. On the other hand, you’ll likely find yourself making several return appearances on Xbox Live. 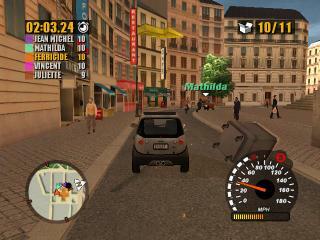 Multiplayer is where Midtown Madness 3 really excels. Capture the Gold, which is a variant of Capture the Flag, Hunter, Tag and Stayaway join the familiar Cruise and Checkpoint in the multiplayer modes, and they all provide excellent solo and team-oriented challenges. You shouldn’t have any problem finding fellow drivers to compete against either. The lobby is a relatively busy joint. For those who prefer to entertain at home, Split Screen and System Link options are also available. 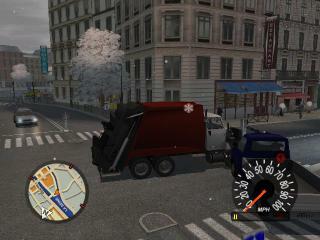 Visually, the vehicles in Midtown Madness 3 are designed very well to match their real-life counterparts. The damage model is… playful. If you smash head first into a brick wall, you might lose your grill and you might pop your hood, but your engine won’t be any worse for wear. In fact, most vehicles take quite a beating before they damage out, and when they do, you magically re-appear in a fresh vehicle. The same happens when you drown in the river. Each vehicle comes with a rating system in terms of acceleration, handling and mass, so don’t expect to turn on a dime in your limousine, but do expect to be an unstoppable machine in your cement truck. There are several colors to choose from for your vehicle, but if you don’t like the selection, you can add to it by collecting spray paint cans located in each city, as long as they match the vehicle you’re currently driving. The only real grip in the visual department would have to be the pedestrians. You can’t really run them over but you can pin them up against walls; although they’ll eventually float through your vehicle and continue on with their daily business. The audio is a mixed bag. The soundtrack is a kind of hip-hop, techno mix that’ll have you reaching for the radio dial. Luckily you can import custom soundtracks into the game, so you can play your favorite driving tunes all you want. The voice acting isn’t bad, but it gets tedious hearing rivals Mathilda and Angelina say the same things over and over. On the other hand, the sound effects are great: roaring engines, squealing sirens, and cursing pedestrians. Ever dreamt of cruising through Paris in an Audi TT, jumping over La Seine, driving under the Eiffel Tower, and racing past the Louvre? Perhaps you’ve fantasized of touring around Washington D.C. in a cement truck, crashing into the U.S. Capitol, smashing through Chinatown, and scaring the suits outside the White House? If such thoughts have crossed your mind, Midtown Madness 3 just might be your ticket, as long as you’re ready to risk that new paint job. Digital Illusions are no strangers to the racing genre. Their previous credits include fellow Xbox alumni Rallisport Challenge. When it came to making Midtown Madness 3, they simply traded realism for a little wreckless abandon. If that’s music to your ears, we can finish the paperwork in my office. If you’re driving solo though, you might want to lease before you buy.